Meditation Gate marks the transition between places and the beginning of a meditation on the environment. Meditation is the practice of focusing the mind: the path starting from Meditation Gate is the beginning of our awareness of being part of a system, ourselves and the environment. 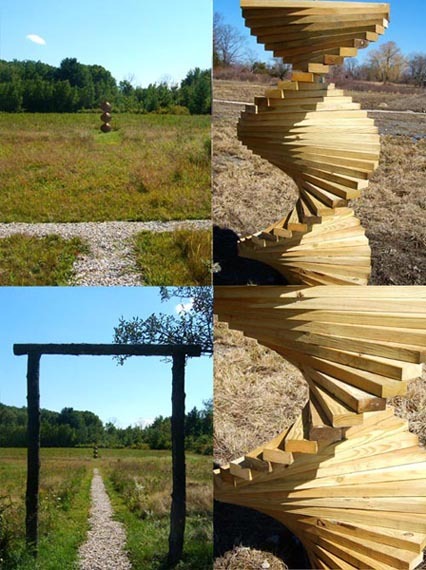 The focal point of Meditation Gate is Time Helix, a sculpture made of 108 rotations of 54 timber segments and erected as a helix. The number 108 has several meanings. Mathematically is the hyperfactorial of 3 as 11*22*33. 108 is also the number of beads in a mala (Sanskrit word for necklace or garland): 108 beads are used in meditation to count the repetition a mantra.